Let us consider an electromagnet, which effects are the same as that of a magnet, yet for which we know the direction of the current that brings about the magnetic effect. I noticed an astounding by its simplicity, phenomenon! Let us choose a coil that is coiled in such a way that when we look at it from one end, the current that enters there flows clockwise (figure 5.4.1 left side). Now turn around the coil and look at the other end, the current coming-out flows counter clock wise within the coil! In essence a given single current is seen as flowing into 2 opposite directions depending on which end of the coil one looks! And that is a phenomenon not mentioned in the science of physics, as far as I can tell. As described in §5.3 and illustrated in figure 5.3.2, a magnetic field in gravimotion is coincidental to the orientation of the pure-activity around the wire; and that orientation is in the direction of the current. As such the pure activity in the immediate vicinity of the coil is re-oriented along concentric circles of even thrusts MOs as represented in figure 5.4.1; these circles, along which the MOs are reoriented, are in planes perpendicular to physics field lines, yet their radius is coinciding to the distances these field lines are from the center of each loop of the coil. Bring the mouse pointer of your computer over figure 5.4.1 and watch an enlarged view of the orientation of space. On the left side MOs and MQs are oriented on average clockwise along the motion of electrons in the wire. On the right side (the other end of the coil) the orientation of space (MOs and MQs) are oriented on average counteclockwise. Note that viewed from the top of the solenoid the current nevertheless circulates in the same direction (that is clockwise) from top to bottom of the solenoid. Yet simply reversing the spatial situation (either by looking the other way or by flipping the coil downside up) is sufficient to ascertain that the 2 ends of a magnet are not alike! This interpretation departs drastically from physics’ right hand rule, which is about a direction of field lines, which direction is neither explained nor implemented physically, and which is furthermore perpendicular to the circular activity represented here. Note that the metal filings of figure 5.2.4 align themselves perpendicularly to figure 5.4.1 (in and out the page or screen) within surfaces implemented by the even layers of same thrust MOs, which surfaces end up looping in the direction of physics’ field lines. In the case of the electromagnet one can simply reverse the current to switch the back of the electromagnet into its front and vice versa! 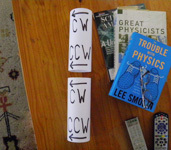 In order to represent 2 electromagnets, which act just as magnets do, I made 2 cylinders of paper on which I drew arrows representing the direction of the current, which is the same at top and bottom of the coil. 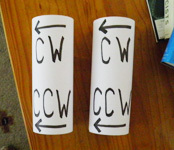 Yet instead of calling the ends North or + and South or - as usually done, I labeled the end from which we see the current flowing clockwise CW, and the other as you might have guessed CCW. Now let’s bring either one of the 2 below the other one. One understands that in between the 2 magnets, the circular orientation of pure-activity spilling out both ends match each other; and their respective declining imprint in space entice them to get closer, creating the strong mutual uniting motion experienced in reality. And that fits also the fact that parallel wires having currents in the same direction attract one another. Either 2 counter clockwise ends confront each other face to face or 2 clock wise do. Amazingly in both cases the 2 identical rotational orientations when turned over become antagonistic and repel each other, creating the twisting and receding motion easily experimented with 2 magnets. A linear (rather than circular) analogy is to think of a magnetic field, as a section of a river, let say 1 mile long, labeled U-D; U being the upstream end; if you look at the U side of that section you see water flowing into it, but water flows out of the D or downstream side. Now imagine that you could isolate 2 such sections including the water flow going through both, and put end to end two D sides, they would repel each other, while a D and U sides facing each other would fit. Physics orientations of lines field (which physical collateral in space is not provided) are not involved in gravimotion’s representation. And that is not surprising as physics field lines orientations coincide to mathematical descriptions that while substantiated through physical experiment, do not provide any qualitative description about a magnetic field very constitution. While mathematics allows describing the effects of the phenomenon with exquisite precision, the mathematics doesn’t tell us a thing about the physical consistency of the phenomenon. That brings us right back to Newton’s remark mentioned in the page "Gravimotion Introduction". Actually there is no north and south poles; north and south poles constitutions are absolutely identical, just as noticed in figure 5.2.4 and 5.4.1! Their relative orientation with respect to each other, and the orientation of space’s pure-activity they create, only are of the essence and suffice to create the amazing magnetic field and motion we witness! As usual it must be furthermore reminded that when acting in a collective behavior, such as in confined-activity for instance and now in this magnetic orientation of space, the motion-occurrences of such a crowd are nevertheless constantly wiggling individually in inclination and in thrust. Individual motion-occurrences in such an oriented-activity obey collective directives on average only.